The poll is the first to probe in depth about the public’s views and knowledge of the nation’s HIV epidemic since President Trump used his Feb. 5 State of the Union address to announce the new initiative to significantly reduce the HIV epidemic in the U.S. within ten years. 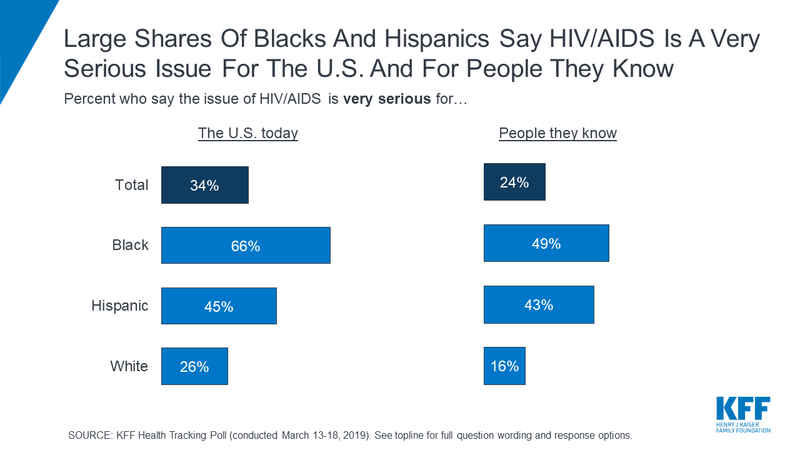 Black and Hispanic adults – populations that are disproportionately affected by HIV – are more likely than white adults to view the epidemic as very serious for the nation overall and for people they know. These differences by race also extend to people’s own personal concerns with nearly four in ten black adults (41%) and half (51%) of Hispanic adults saying they are concerned about getting HIV compared to one in ten white adults (12%). The survey also assessed public awareness of newer HIV prevention and treatment strategies. 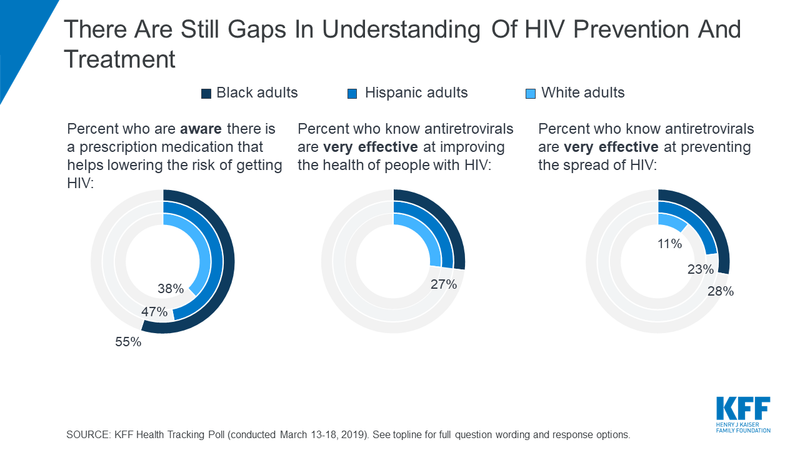 Less than half (42%) of the public overall is aware of PrEP, a prescription medication that dramatically lowers the risk of getting HIV when taken as a preventive measure. Awareness of PrEP is highest among black Americans (55%), though a significant minority (45%) don’t know such a drug exists. PrEP awareness has increased since 2014, when 14 percent of the public knew about the drug. There are also gaps in understanding about how antiretrovirals (ARVs), the medications used to treat HIV, work. Small shares are aware the medications used to treat people living with HIV are “very effective” at both improving the health of people living with HIV (27%) and preventing the spread of the virus (15%). Awareness about antiretrovirals’ ability to stop the spread of the virus is somewhat higher among black and Hispanic Americans than white Americans, but the vast majority across all groups underestimate its effectiveness. Half (52%) say the U.S. is making progress in addressing the impact of HIV in the country, an increase of 12 percentage points since 2014. Few (8%) say the U.S. is losing ground. Few Americans (8%) say they have heard or read about the Trump administration’s initiative, though most (56%) say they are confident that the U.S. can achieve the goal of eliminating most new HIV infections by 2030. Most of the public say they are comfortable working with (79%), having a close friendship with (77%), and sharing a living space with (62%) someone who is living with HIV. This is true across racial and ethnic lines. KFF (Kaiser Family Foundation), a leader in health policy analysis, health journalism and communication, is dedicated to filling the need for trusted, independent information on the major health issues facing our nation and its people. The Foundation is a non-profit organization based in San Francisco, California and is not affiliated with Kaiser Permanente.